On the site you will see multiple NHL models. The top performing model is called RUS. Three other models (1,2,3) are provided that are optimally used as inputs in your own models. European predictions will be posted overnight (eastern time). NHL predictions will be posted by around noon (eastern time). A 1-month subscription costs $1099 (CAD) for about 900 games of predictions. Our statistics tables are free to use. RUS is a proprietary model that provides the score and win probability for every NHL game. This model is influenced by roster choices so it will be periodically updated throughout the day as team’s finalize their lineup decisions. The model was backtested using the same methodology here. 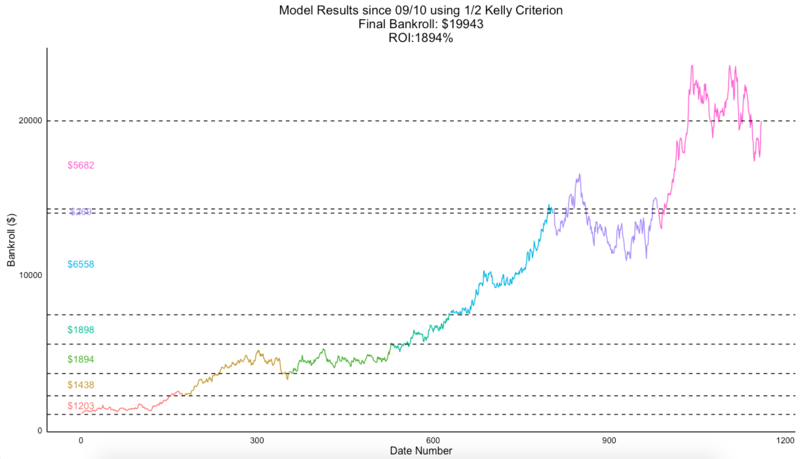 As is common in the field, the rationale behind my staking plan is the Kelly formula, which accounts for both the difference between bookies and modeled odds (the advantage we think we have on the bookies) and the probability of winning. The outcome from the Kelly formula is an estimate (f) of the fraction of our bank we should stake on a given bet to guarantee an optimum return on the long term. This in essence is what drives the stake when following the Kelly strategy: your bet size increases with both your chance of winning and the advantage you think you have on the bookies. This works out at: (0.52x1 – 0.48) / 1 = 0.04. Therefore the Kelly Criterion would recommend you bet 4% of your bankroll. The Kelly Criterion works very well when you know the exact probability of your bet (a coin landing on heads) but runs into issues when less precise odds (a hockey team winning a game). Overconfidence in one’s ability to know their precise odds can lead to over betting (betting too much) which will lead to long term loss. That is why we recommend people use a fractional Kelly Criterion, in our examples we use Half Kelly Criterion meaning we take our recommend bet size and divide it in half. Building off our coin flipping example, if we were using a Half Kelly Criterion we would bet 2% of our bankroll. Here are the model results if you invested $1,000 in 09/10 and then continued to reinvest your winnings each season. Profit each season is noted on the left of the graph at the corresponding dotted line. 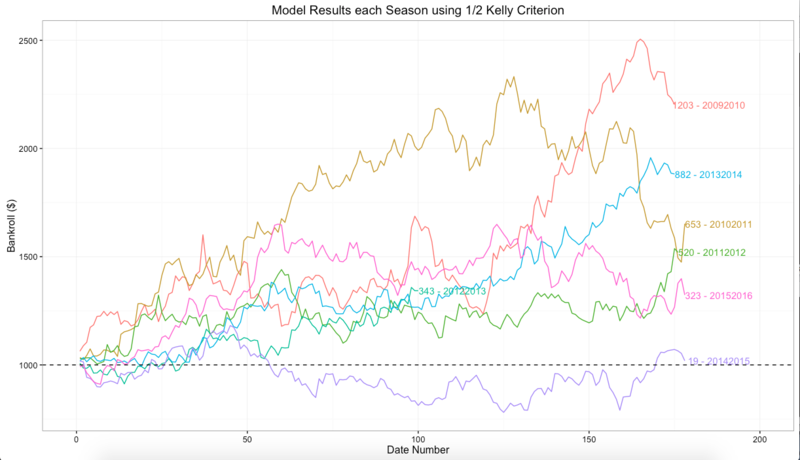 Here are the model results if you started each season with a $1,000 bankroll and did not reinvest your winnings. Profit each season is noted on the right of the graph. We implore people to use this information smartly. Make sure you find a staking plan that suits your risk appetite and your overall bank size. Do not bet beyond your own personal means. All seven years previously have shown to provide value, but the future is not guaranteed. We do not sell this service with the promise of profitability. We do sell this service with the promise of providing the same analysis the generated results detail above.